In a relationship between an Aries and a Cancer the first aspect that really jumps out at you is family. Both Aries and Cancer are devoted and dedicated to their families and to family values. However, a Cancer is even MORE devoted. This being said, one of the negative aspects of a relationship between an Aries and a Cancer is that the relationship may be suffocating due to the Cancers overbearing attitude related to family. While an Aries has all the characters required for being family-oriented, he/she needs their freedom in order to be satisfied. On the other hand, Cancer will need affection, intimacy, and dependence to lead a satisfactory life. This is why Aries and Cancer need to balance their lives. In worst cases, an Aries might seem very cold and impersonal while a Cancer person is extremely sensitive and fragile. Aries and Cancer are each other’s teachers in a relationship. The longer the relationship- the more likely it will succeed. This is because throughout the relationship Aries learn sensitivity and compassion from the Cancer while the Cancer can learn how to be independent. If this relationship is going to work out, the Cancer has to try not to be too sensitve at things and occurrences! Aries and Cancer can be challenging relationship to make work. The low scores represent the initial compatibility of this match. However, you are both strong willed enough to make this work, and if you succeed the scores will be much higher. If you can both adapt to the others style this is a relationship which will improve steadily over time, and eventually rival any other match. The low scores represent a high initial challenge, and not a long term pessimistic view. Dating for Aries and Cancer might start off a little rocky. 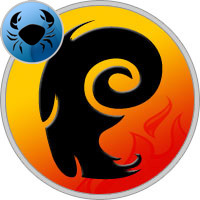 Sensitive Cancer will have a hard time dealing with the blunt directness of Aries. Aries may not understand such sensitivity and hurt feelings. The good news, however, is that these two zodiac signs have an intuitive link and strong attraction that could turn dating into love. A lot of work needs to be done. Astrologically, after the potent sexual connection comes the downfall. Something will cause Cancer to turn moody, causing Aries to withdraw, causing Cancer to cling. The only way a long-term relationship can work for these two zodiac lovers is to recognize the feelings and needs of each other, work on their kindness toward each other and a little compromise wouldn’t hurt. An Aries and Cancer sensual connection can be extremely strong. The Cancer woman is perfect for the Aries man who loves to sweep his woman off her feet. This same boldness in an Aries woman will make a Cancer man feel as though his dreams have come true. The main erogenous zone for both zodiac signs is the chest. For both to experience the somewhat rough that Aries loves, Cancer must feel safe and able to trust. Aries’ horoscope would advise, “Make Cancer feel safe now, adventurous love later.” A horoscope for the Cancer lover would suggest asking for a little patience from Aries. Marriage could be questionable. While Cancer would prefer to stay home, cook comfort food and relax, Aries prefers to be out on the town. Cancer must accept that Aries needs alone time and trust their lover to be out on their own. Cancer wants to feel loved and needed, but Aries has to learn that this desire for security is not a weakness or need for emotional drama. These two zodiacs will need to practice patience and understanding for binding love in this relationship to build.